This one-of-a-kind bouquet is made to order with the most beautiful, fragrant flowers available. Delivered in a stylish glass vase, the flowers included in each dazzling bouquet are selected to give maximum value for the price. Freshest Flowers of the Season is a hand delivered gift. These gifts are delivered by one of our local design centers located throughout the United States and Canada. Same day delivery is available for most gifts when ordered before the cutoff time. 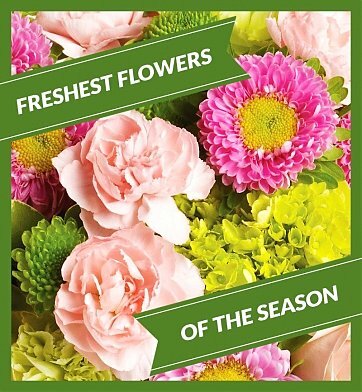 The cutoff time for Freshest Flowers of the Season is in the recipient's time zone. The flowers were delivered on time, and were gorgeous. They made my sister very happy after having surgery which was wonderful since I live far from her and couldn?? ?t be there! I was and my daughter was very pleased with the job that was done for my daughters flower arrangement for her birthday. I will order from you folks again when needed, again very pleased even with customer service. My mother LOVED the flowers! I wish I could have been there for Mother's day but flowers are the next best thing! I always use this site! This is one of the prettiest arrangements I have ever sent. The florist involved did a marvelous job! My daughter-in-law loved her birthday flowers and chocolates. I sent the flowers to my brother who recently had open heart surgery. He and his wife both said that the flowers were beautiful. Thank you so much. I was sent a picture of this bouquet from one of the participants of a 90th birthday celebration. The arrangement was sent to the restaurant as requested and in plenty of time. Oma loved the arrangement. The florist did a wonderful job and I wouldn't hesitate to request their services again. I would definitely recommend them. They have a wide variety of arrangements at very affordable prices and will work with you if you have something in mind that is not in their list of arrangements. You won't be disappointed. The birthday gift arrived on time and was a great surprise. Flowers were fresh and neatly arranged. Ordered the Designer's Choice arrangement. What was delivered was something that I would have been charged three times more at any other floral shop. Stunning! The customer service was exceptional as well. They were able to accommodate a last minute change in delivery address. Will go back to them for all my floral needs. I ordered flowers online from the shop for the first time. Usually I call and all the arrangements have always been outstanding. There was a mixup on the delivery day which was a bit disappointing, but when I called the call was handled in a professional and courteous manor, the mistake was acknowledged and the order was upgraded. What more could you ask for at that point? My sister sent me a pic of the flowers and they were lovely. It was a gift so I didn't see it but the recipient raved about it and said it was absolutely beautiful. I was informed that it was ready for delivery and it arrived on the date requested. I think the price was very fair for the quality and good service. Would definitely use again. This is the first time I have selected the "Designer's Choice" for a floral arrangement. I sent this to my daughter for her 30th birthday and she said they were simply beautiful. She keeps the flowers on her desk so she can enjoy them each day. They did a wonderful job, my daughter loved the fresh flower arrangement. I highly recommend. for called and complimented your florist on the arrangement and the choice of flowers. She said it was the most beautiful flowers she had ever received. They were delivered on time. Our Fiends were delighted with the flowers from yourselves they sent us a photo and they looked beautiful! I leave in Europe, and I found this flower shop very easy to deal with. I went with the Designer's choice for my sisters birthday, and looking at the pictures she sent, it looked fab. Although I could not be there personally, it is a great help that they delivered on the day I have asked, and it was a nice touch that the message I sent was hand written on the card. My grandmother said the flowers were beautiful and the vase was very nicely matched with the flowers. The florists did a wonderful job! I had an arrangement sent to my daughter for her birthday. The flowers were beautifully picked and arranged by a local florist and delivered to her college dorm! I will definitely use this florist again and will recommend them to all my family and friends! Thank you! Recipient was please with the delivery, freshness and arrangement of flowers. I will be telling my friends about your timely services and I will order again. We sent the designer's choice flowers to our granddaughter congratulating her on her first day of a new job. She said they were beautiful! The "Freshest flowers of the Season" bouquet I sent arrived on time. The arrangement was gorgeous and colorful, flowers fresh. The vase itself was a step up from the usual plain florist vases. The recipient was thrilled at how beautiful this was. This was my first online floral purchase I couldn't be more pleased with everything and I certainly will use your service again. Flowers were beautiful and delivered on time as promised. Our friend enjoyed the flowers very much. The colors were a concern but your choices were perfect. Thank you. The flowers were ordered for our son and daughter in laws 15th anniversary. The order arrived in a timely fashion. Our daughter in law text-ed us a picture of the arrangement. They were beautiful. We all liked the arrangement. I sent the Freshest Flowers of the Season to my Dad for Father's day. First... flowers for a man can be a tricky thing. Second, you don't know what the flowers are... he sent me a picture and they were great! I will be doing this again for other occasions. My friends loved this arrangement, and they said the vase was so pretty! Very speedy, too! These flowers made my grandmother's day! By the looks of the picture they looked fresh and lovely. I recently sent flowers to my Step-Mother from your shop, via the internet. She was very pleased with the arrangement and said they were truly beautiful. I prefer to deal with a florist that is local to where my loved ones are, because I feel they will do a great job in taking care of them. Thank you for your great service! I normally buy flowers through a different vendor. This was my first time using this company to order flowers. So happy I did, they had the best price. I ordered the "designer's choice" and it was perfect! My mother loved the arrangement and even 6 days later they still look great. I definitely will order through you again. I used your service for the first time and was very impressed with Ashlee, who tried her best to help me out during the busy Mother's Day weekend with a delivery issue. It all got sorted out and I hear the flowers were lovely. Thank you , will definitely use your service again. Arrived as scheduled, were fresh and lovely. Would order again. I ordered the designer's choice so I could have the designer express his or her creativity for the moment and all I have to say is that the floral arrangement exceeded my expectation. An absolutely gorgeous arrangement! You made the birthday girl very happy! Thank you! My mom was very impressed with the flowers that were sent and if she liked the gift, so do we! This is the second time I've used this service and both recipients loved the gifts. We especially appreciate the fast delivery time. Thanks! We'll definitely shop this service again. I ordered these for my sister in law for her bday and they turned out lovely! I had no idea what it would look like, as it's designer's choice but I figured since it's freshest flowers of the season and the designer would have the freedom to arrange it however they like, it would be the best choice and I was right. The arrangement looked really nice and my sis in law was surprised and loved it. So I would recommend this item for sure and will be getting it from now on whenenever I want to send a gift to a loved one in the future. My friend sent me a picture of bouquet. She was happy. Long lasting bloom and beautiful display. I am from Scotland and ordered this bouquet for my daughter in Dallas to thank her for treating me to a trip to New York. She was delighted with the flowers and sent me a photo, very colourful with autumn colours and they were delivered right on the day requested. The flowers were for my sister who had recently undergone surgery. She said they were absolutely beautiful! They were a huge assortment of fresh flowers. I would recommend these flowers to anyone wanting something colorful and fresh to brighten someone's day! Excellent service and I will definitely be using this company again!! The recipient really love the flowers and told me how beautiful they were. Although I didn't personally see the flowers, I chose Designer's Choice twice as a gift and both recipients said they really enjoyed the flowers, so I will choose this option again. The flowers were very fresh and colorful. My mother-in-law loved the gift! Thank for the great quality and service! I highly recommend this gift! I did not see the flowers but my daughter, the recipient, said they were beautiful and smelled very nice. They were delivered on the day promised.